If you are like me, intimidated by all things baking, this simple, quick and easy recipe would turn you into a baking addict (to a degree). Preheat the oven to 375F (190C) and prepare a muffin pan. Melt the butter, take off the heat and add olive oil. Set aside. Whisk together all dry ingredients, except baking soda. Mix together buttermilk and baking soda, add it to the butter and oil, and mix well. Add butter mix to the bowl with dry ingredients, and stir to form a batter. Do not overmix! Pour the batter into the muffin pan, and bake around 18-20 minutes, turning the pan 180 degrees half way through the baking. Muffins are ready when a wooden stick (toothpick, small skewer, etc. ), inserted in the middle of the muffin comes out dry. I tested this recipe many times with different proportion of polenta and flour, and ratio 1:1 works the best: not too dry from the corn, and not too heavy from the flour. I also tested different fats, including lard (my favorite), but because good lard is hard to find (I made my own lard to use in this muffins), and store bought has so many additives, I did not include it in this recipe. However, if you come across good lard, that has only one ingredient listed, which is... yes, lard, I encourage you to try it. You can use 60 grams butter and 60 grams lard, or just lard. The result is "melt-in-your-mouth" muffins. The muffins (and your photo) look wonderful. And with the pepper in it, I bet you wake up right away! I'm always looking for something to bake that doesn't have any sugar! These sound perfect for me. I can't tolerate sugar but these are so low in sugar, I'm sure they would be fine! Thanks for sharing! I've been thinking about you and hoping things are working out! Sweet hugs! Hi Diane, I don't like sugar (or any sweets), and made this muffins many times without sugar at all. And can tell you they taste just as good. In the summer I made sugarless jam (just what natural sugar in berries), and it goes perfect with those muffins. If you can tolerate agave nectar, it has low glycemic index, you can add a teaspoon of that to the whole batch. I'd love to have these for breakfast, looks delicious! Great idea with the pepper, cool way to start the day! They look delicious!!!! Yummy. Your recipe has many possibilities. Toss in some finely chopped onions, some graded sharp cheddar cheese. Spread butter on them right from the oven while they are warm ... I don't know how I'm going to get to sleep. Now I'm hungry. Thanks Sheila, yest, it is basic recipe, anything can be added to it! My mouth is watering looking at the picture! These muffins look delicious! Beautiful muffins Marina! I used to be intimidated by baking kneeding etc. but I have started getting rid of these burdens and I feel happier! How yummy! Yes, they'd definitely wake me up! 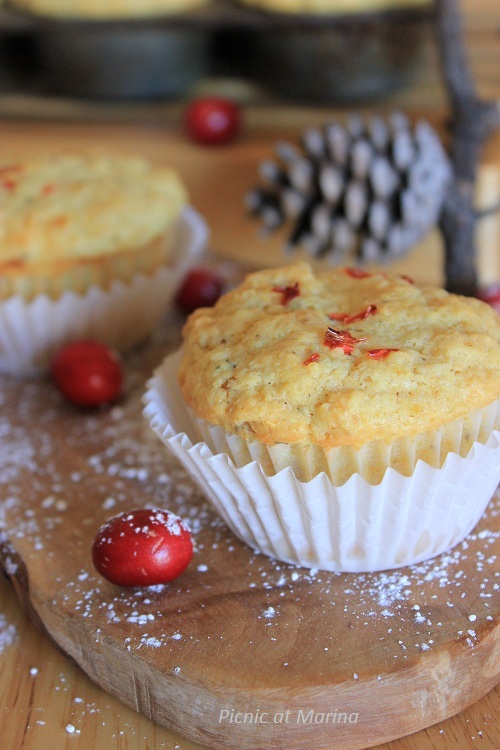 It's a great idea to bake some savory muffins, these are so great with soup ans stews! 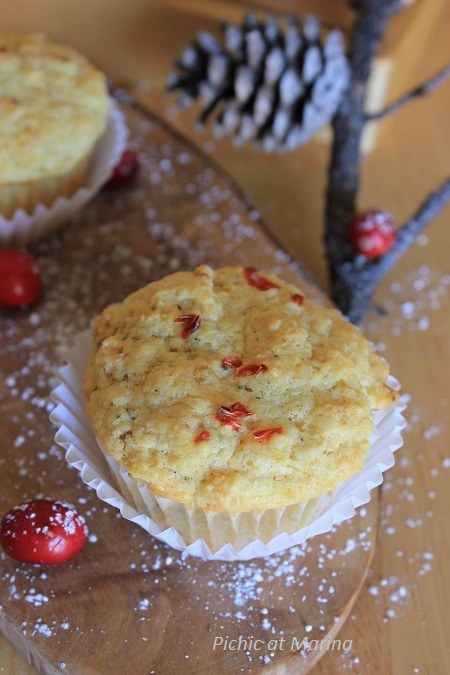 Love these spicy polenta muffins! Great idea, I do not like to bake but I think I can handle this. Norma, this we have in common: I don't like to bake either, but I am getting better, little step at a time! I love the pep in your post and beautiful sunrise. I also love easy throw together muffin recipes as these. I kept hearing that song by George Michael, "Wake me up before you go go," as I read your post. I need to start making my own lard. I agree with you that its flavor is wonderful, but good quality is so hard to find. Anyway, great muffins! I'd gladly have one of these in the morning (or anytime!). Good stuff - thanks. Sure, we would have so much fun! :)Come with all your family! These muffins sound delicious! The texture looks fantastic. I've never considered polenta as a flour before. I love this idea. Hi Mary, corn flour would work too I just love polenta...:) Thanks for stopping by at my blog! When I read that these polenta muffins were called "Wake up" I assumed that was because their yellow color mimicked the Sun ... then I saw the cayenne & jalapeño peppers. Well, Marina, these are sure to wake me up! A savory, spicy muffin to start my day. Sounds better than a shot of espresso! Thanks for sharing. Nice idea Marina: polenta and muffins! If there is a pinch of hot pepper I prefer them without sugar...like you. I am not a big sweet eater, and always (almost) adjust the recipe, even my mother's and grandmother's. 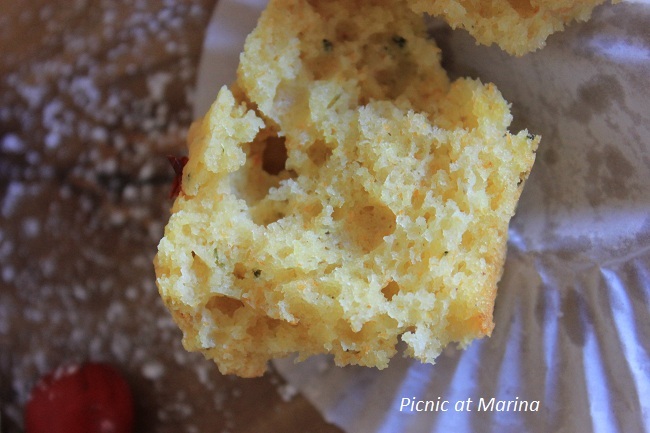 Wow, polenta muffins! And your addition of cayenne pepper makes them even more appealing! 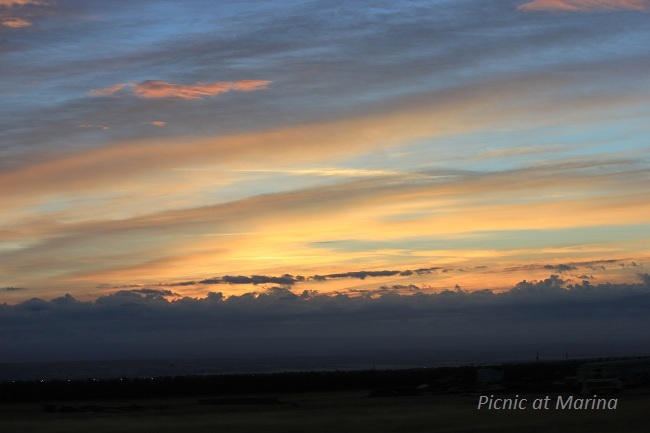 I love your sky shot. After having Instagram account, I have to say I look up sky more often...for some inspiration! Your photo looks beautiful!